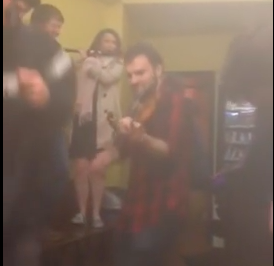 This Video Shows One Way For Taxis To Compete Against Uber: Have A Trad Session In The Office! Waiting for a taxi in the early hours is a sure way to kill the feeling from a good night. But in one Galway taxi office it became part of the night as 2 trad bands burst into an impromptu session that had people coming in off the streets. Local bands Porterhead and Simpsons Three had finished their sets in local bars and were waiting for a taxi home. As usual of course the taxi can take a long time. So to relieve the boredom the two bands started an impromptu jam session that was so infectious the other customers started to dance. It was so good that people even started coming in off the street! Maybe this is the way for Taxis to combat Uber!